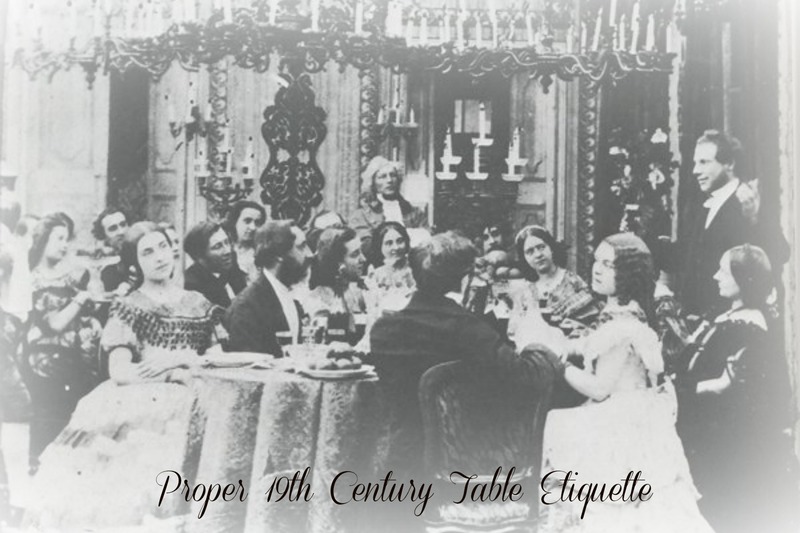 “In order to appear perfectly well-bred at table when in company, or in public, as at a hotel, you must pay attention, three times a day, to the points of table etiquette. If you neglect these little details at home and in private, they will be performed awkwardly and with an air of restraint when you are in company. By making them habitual, they will become natural, and appear easily, and sit gracefully upon you. 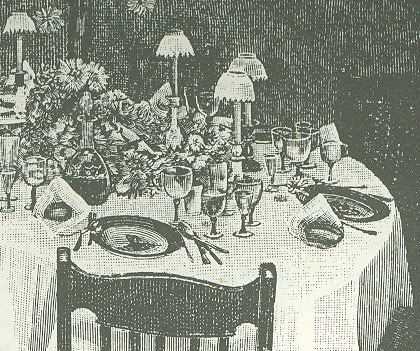 Even when eating entirely alone, observe these little details, thus making the most finished and elegant manners perfectly familiar, and thus avoiding the stiff, awkward air you will wear if you keep your politeness only for company, when you will be constantly apprehensive of doing wrong. 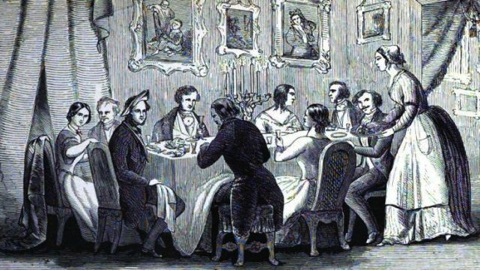 At breakfast or tea, if your seat is at the head of the table, you must, before taking anything upon your own plate, fill a cup for each one of the family, and pass them round, being careful to suit each one in the preparation of the cup, that none may return to you for more tea, water, sugar, or milk. If you have a visitor, pass the cup with the tea or coffee alone in it, and hand with the cup the sugar bowl and cream pitcher, that these may be added in the quantity preferred. After all the cups have been filled and passed round, you may take the bread, butter, and other food upon your own plate. Train your children, so that they will pass these things to you as soon as they see you are ready to receive them. If you are yourself at the side of the table, pass the bread, butter, etc., to the lady at the head, when you see that she has sent the cups from the waiter before her, to those seated at the table. 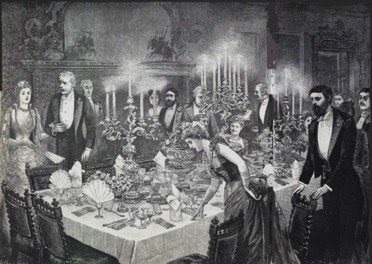 If you occupy the place of head of the table, you must watch the cups, offer to fill them when empty, and also see that each one of the family is well helped to the other articles upon the table. Avoid making any noise in eating, even if each meal is eaten in solitary state. It is a disgusting habit, and one not easily cured if once contracted, to make any noise with the lips when eating. Never put large pieces of food into your mouth. Eat slowly, and cut your food into small pieces before putting it into your mouth. Use your fork, or spoon, never your knife, to put your food into your mouth. At dinner, hold in your left hand a piece of bread, and raise your meat or vegetables with the fork, holding the bread to prevent the pieces slipping from the plate. If you are asked at table what part of the meat you prefer, name your favorite piece, but do not give such information unless asked to do so. To point out any especial part of a dish, and ask for it, is ill-bred. To answer, when asked to select a part, that “it is a matter of indifference,” or, “I can eat any part,” is annoying to the carver, as he cares less than yourself certainly, and would prefer to give you the piece you really like best. Do not pour coffee or tea from your cup into your saucer, and do not blow either these or soup. Wait until they cool. Use the butter-knife, salt-spoon, and sugar-tongs as scrupulously when alone, as if a room full of people were watching you. Otherwise, you may neglect to do so when the omission will mortify you. Never put poultry or fish bones, or the stones of fruit, upon the table-cloth, but place them on the edge of your plate. Do not begin to eat until others at the table are ready to commence too. Sit easily in your chair, neither too near the table, nor too far from it, and avoid such tricks as putting your arms on the table, leaning back lazily in your chair, or playing with your knife, fork, or spoon. Never raise your voice, when speaking, any higher than is necessary. The clear articulation and distinct pronunciation of each word, will make a low tone more agreeable and more easily understood, than the loudest tone, if the speech is rapid or indistinct. Never pass your plate with the knife or fork upon it, and when you pass your cup, put the spoon in the saucer. Never pile up the food on your plate. It looks as if you feared it would all be gone before you could be helped again, and it will certainly make your attempts to cut the food awkward, if your plate is crowded. If there is a delicacy upon the table, partake of it sparingly, and never help yourself to it a second time. If you wish to cough, or use your handkerchief, rise from the table, and leave the room. If you have not time to do this, cover your mouth, and turn your head aside from the table, and perform the disagreeable necessity as rapidly and quietly as possible. Avoid gesticulation at the table. Indeed, a well-bred lady will never gesticulate, but converse quietly, letting the expression and animation of her features give force to her words. I am so amazed at the ‘modern dinner-table’…..it closely resembles my grandparent’s table when I was 12 and younger….I am now 71 years of age. They had a cook and a server. We used finger bowls at the end of some meals. 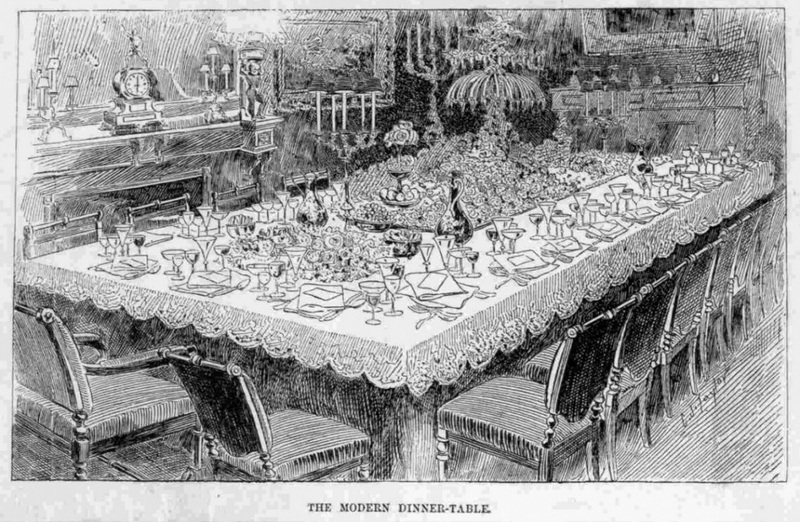 But the pictured table is no modern dinner-table of today….most don’t have the income folks did before the income tax was foisted on us….thus we see little of the lovely huge tables and settings in most homes….and women are not there to take the care of creating such beauty….it is a crime against family and home as far as I can tell. The federal government wanted more and more taxes so made women feel that working out side of their homes would make them feel more important…thus they did and paid their taxes from income and thus the home was basically just a stopping off sleeping place. No family warmth, comfort, freedom, security for children (if there are any now much!) no beauty , no serenity, just a weigh station. Totally tragic so see and ‘feel’ ….a sense of great loss of something warm and intangible and solid.